Staphylococcus aureus is resident in skin and nasal membranes with a formidable pathogenic potential to cause a variety of community and hospital acquired infections. This authoritative survey covers the impact of genome sequences into our understanding of MRSA and MSSA pathogenesis. World specialists from America, Germany, Japan, Sweden and the UK contribute knowledge and experience which will be welcome to researchers, practitioners and postgraduate students of immunology, microbiology, bacteriology and pharmacology worldwide. Staphylococcal infection: Emerging clinical syndrome; Epidemiology of MRSA and MSSA; The staphylococcus aureus genome; Virulence gene regulation and pathogenesis of disease; Pathogenesis of disease; Antimicrobial resistance and therapy of staphylococcus aureus infections. 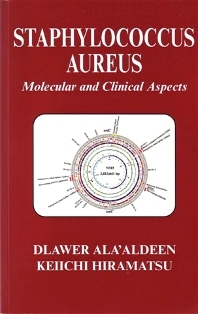 Dlawer Ala Aldeen, University Hospital, Nottingham, UK. Keiichi Hiramatsu, University of Juntendo, Japan.